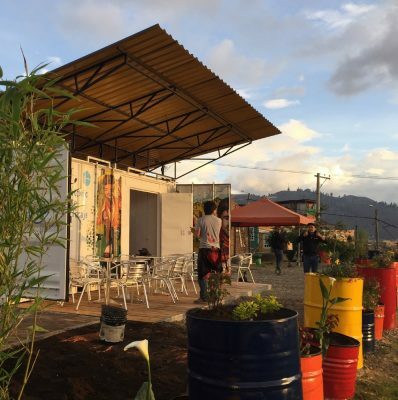 The Zubabox was formally handed over to local youth foundation Tiempo de Juego, which works to creative positive change for young people in Cazuca, near Bogota – a community marginalised by poverty and violence. The project aims to provide a safe and sustainable environment where local children can develop social and digital skills, and a friendly and inclusive community as an alternative to the prevalent culture of gangs and crime. 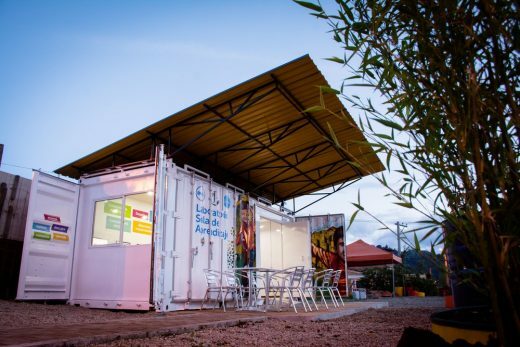 Squire and Partners was initially approached by Computer Aid International in 2014 to design a prototype Solar Learning Lab as a series of mobile units providing internet connectivity to remote communities without access to mains electricity. 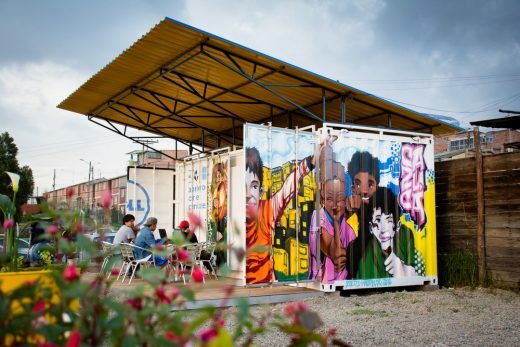 The basic unit, currently used in ten locations across Africa, is constructed from a recycled shipping container with solar panels on the roof, and utilises refurbished computers donated from the UK. The practice was asked to design a more cost efficient, practical and enjoyable environment for the users. 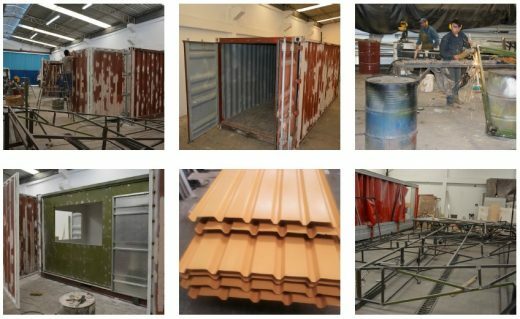 Initial investigations and prototypes – developed in collaboration with lighting, services and structural consultants – assessed issues such as security, cross ventilation, thermal zones, overheating, maximising solar gain on the roof, flexibility, storage and the provision of teaching facilities. The practice explored connectivity between units, extending the external deck to increase available learning and social spaces, and landscaping designed to connect the box to its location. Squire and Partners’ final design presented a simple modular system which can operate individually or as part of a group. Maximising the possible amount of openings – working within the limits of structural integrity – increases cross ventilation and natural light, and creates a shaded deck which expands the usable area and facilitates integration with the existing community. A larger roof size additionally allows for an increased number of solar panels. Internally, a skin of plywood softens the working space and can be easily personalised by the users. Computer stations can be orientated either around the box perimeter for individual working, or facing inwards to a central bench creating a social and inclusive atmosphere. 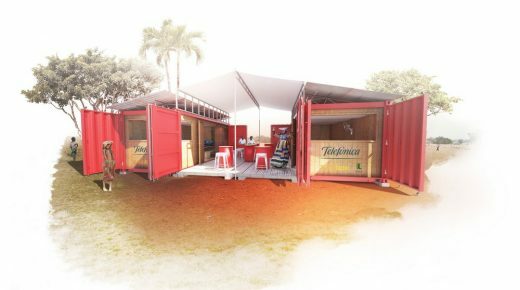 Areas have been designed specifically for potential sponsors of the programme alongside corporate social responsibility commitments, a key part of Zubabox’s future. The Zubabox in Cazuca was locally converted and fitted out in Colombia. In addition to commissioning a Columbian container conversion company, the practice worked with local furniture makers Saint George to produce a range of bespoke timber seating and desks which easily store away when computers are not in use. 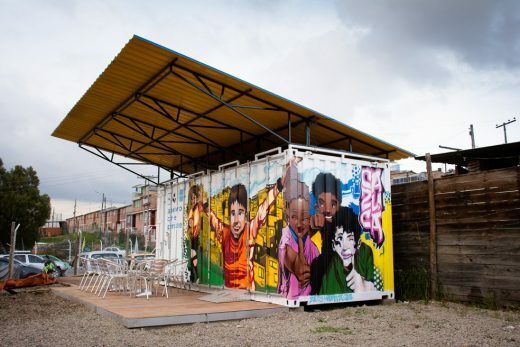 Following the Zubabox’s installation on site, two Cazuca based graffiti artists – Delix and Zhed1 – were commissioned to adorn the box with an artwork which roots the facility into the community. Squire and Partners donated recycled oil drums, and spent the day before the launch planting native trees and flowers to create a vibrant landscaped area around the site perimeter. 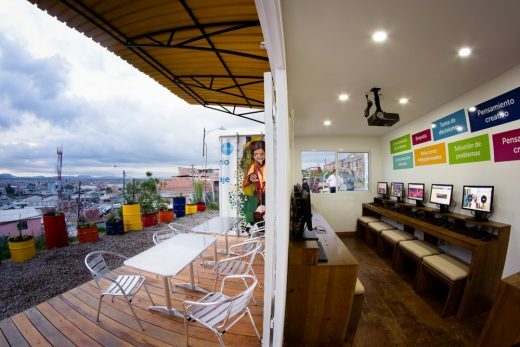 The opening of the Solar Learning Lab was attended by the local community and a series of high profile government officials including Columbia’s Minister for ICT and the Mayor of Soacha. From the design and delivery team, the event was attended by representatives from Dell Latin America, Computer Aid and Squire and Partners. Tim Gledstone, Partner at Squire and Partners, said: “The design is deliberately extroverted to encourage inclusion and interaction by maximising openings, which in turn offer stunning views across the city. The immeasurable reward in seeing how design can be a catalyst for community empowerment, opportunity and shared potential was fantastic. Collaboration between partners in the UK and Columbia led to a meaningful outcome for all involved – we are proud to have been key players in the team delivering Cazuca, and are looking forward to continuing the relationship in other parts of the world.